Pain-Gakido or the Preta Path of the Sixth Path Sage. The Preta Path Pain has the ability to absorb chakra from the opponents. Nagato make use of one of the shinobi from the Village Hidden in The Grass to channel the Preta Path. As this path is able to absorb chakra of any form, still when it absorbs too much of senjutsu (sage chakra) it will change the user to a stone statue. 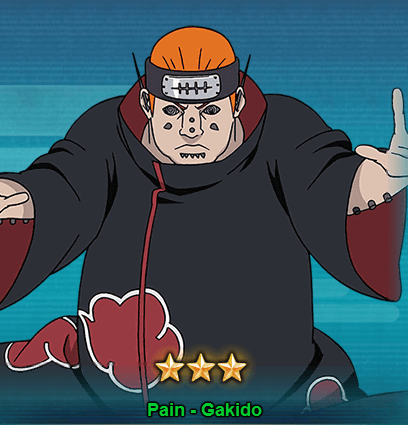 Let’s take a look at Pain-Gakido abilities. Ninjutsu Sealing Jutsu – Absorption[Prompt]: Generates a Shield to a selected unit, this Shield is based on 80% of the unit’s Resistance base attribute. Also, it will cancel all its Debuffs and will make that unit immune to Debuffs for 1 round. Taijutsu Gakido Attack: Chases and Attacks a Knocked Down unit, cause Ninjutsu damage and Low Float and recover a certain percentage of your own Life, triggered twice at most each round. Ninjutsu Absorption of Debuffs: Before each action, cancel one layer of Debuffs on your own entire team. This is triggered twice each round. Ninjutsu Rinnegan – Resistance: At the beginning of a battle, all Rinnegan attribute units in your field will have their Resistance increased by 60%, lasts for 3 rounds. You will recieve Pain-Gakido for free when you complete Chapter 9 Instance. You can also get Pain-Gakida from the Tendo Treasure and Ranked Battle Shop. It will cost around 40-60 seal scrolls and Tendo treasure but it depends on which Pain ninja you get first. As for the Ranked Battle shop it will cost 1000 rank points for 2 fragments of Pain-Gakido.